Respawn Entertainment has announced the contents of game update three for its hugely popular online FPS, Titanfall. The content of this update is extensive, but perhaps one of the most eye-catching features on PC is what they’re calling extreme frame-rate support with a whopping maximum of 144 FPS! The likelihood is that you’ll need a whopping PC to have a chance of running Titanfall at such a high frame-rate, not to mention that it’s questionable whether you would truly notice the leap from 60fps, but it’s certainly an interesting proposition. Custom load-out names – You can now name your custom loadouts for both your Pilot and your Titan. 2 dedicated Custom Loadouts per game mode – Each of these 2 loadouts become unlocked after playing the game mode 5 and 10 times respectively. These loadouts are only available in the game mode they are listed under. In a Private Lobby, all game mode loadouts can be customized. In a match lobby you can only customize the loadouts for the game mode about to be played. Extra Look Drift Guard – We added a new “High” setting to the “Look Drift Guard” controller option. This is useful for players experiencing and being bothered by view drift on their controllers. Players who prefer the original behavior should set this to “low”. Level Stats – We added a new menu under “Personal Stats” showing statistics per map such as how many times you have played each game mode, or won each game mode. This allows players to easily track the achievement “I’ve Seen It All” requiring that you play each mode and every map. Campaign MP – The campaign menu now shows a small trophy icon for each faction for every level that you have won. This will allow easier tracking of which campaign levels you have won for the achievements “Militia Elite Pilot” and “IMC Elite Pilot”. Regen Challenges – We found that some players erroneously believed that the requirement challenges for Regen only became available when they reached level 50. Now, when Regen challenges become available, they are marked as “new” with an exclamation point, so players know they can start progressing on the Regen Requirements. Amped Weapon pickup distinction – The pickup prompt for Amped Weapons dropped by other players will now show up in orange text. Scoreboard Icons – We have added two new scoreboard icons to provide additional awareness during play. One is an icon that indicates that a dead player’s Auto-Titan is still alive. The other is an icon to differentiate players who have successfully evacuated during the Epilogue. Extreme frame-rate support – The game now supports refresh-rates up to 144fps. Audio Installer – The audio file installation step is much faster. No more long wait times. Scoreboard Controls – Added bindings to mute players from the in-game scoreboard. Defaults: Page Up / Page Down to select, Delete to toggle mute, Enter to view profile. New chat icon – Added an icon to the scoreboard and lobby screens to show when a player is in Xbox party chat and therefore not part of the game voice chat. Match win/loss credit – Players are now rewarded win/loss credit at the moment of Victory/Defeat, rather than after the post-game scoreboard period. You also now receive a loss if you leave a match before a winner is determined. Previously you received neither a win nor a loss if you quit before the post-game scoreboard. Normal Eject – Damage and area of effect has been decreased. Previously, a normal Titan eject caused damage over an unintentionally large area of effect, slightly larger than the circle outlining the statue in Corporate. This has been reduced, and the damage has been reduced as well. This brings the effect in-line with the ejection visual FX. The original intent of the eject explosion damage was to reward an ejecting pilot for accurately anticipating or baiting an enemy Titan into an execution attempt, but the size of the explosion made this too easy. Nuclear Eject – Now does more damage against Titans. Previously an Atlas with full health could survive a close range Nuclear Ejection. Given the long “tell” that Nuclear Eject has, we decided it is appropriate for it to decimate Titans that are within the blast radius. Build time – Shooting enemy mega turrets or evacuation drop-ships now rewards you with Titan Build Time or Titan Core Charge Time. You do not get build time for the regular drop ships because they do not hover long enough to make destroying them a reasonable or gameplay-meaningful player objective. Emp effects – No longer mess up your screen while you are inside dome shield. MVP – Killing the other team’s MVP now gets you 25 points. CTF Assist points – Players are now awarded Capture the Flag assist points. If you help carry a flag back to base you will receive 100 points as long as the flag was never returned by the other team between you possessing it and your teammate capturing it. 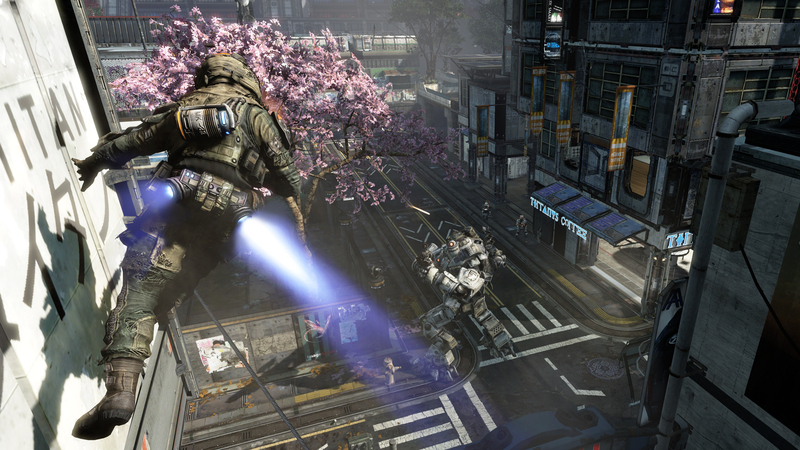 Titanfalls – Disabled Titanfall near the evacuation location and stopped Titanfall from doing damage to the drop-ship. Dropping your Titan on the evacuation ship was not an intended behavior.